When I started the Memoirs of H.H. Lomax series, Bantam asked me to do one of the three books on Jesse James. I went along with the request even though Jesse James was not one of my favorite characters from the Old West. While I was not as excited about this book as I was about the Billy the Kid and O.K. 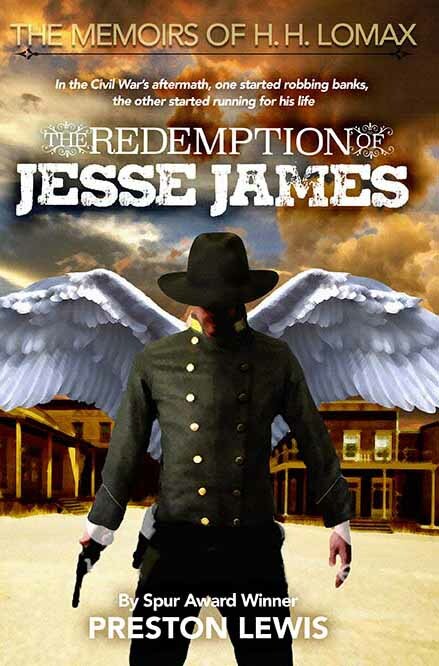 Corral books in the Lomax series, The Redemption of Jesse James actually became my favorite of the 30 books I have written. Jesse James is a peripheral character for most of the book, though Lomax does accompany him on his first bank robbery and visits him the day before he is shot. The book instead is a coming-of-age story about Lomax during the Civil War years. What I like most about the book was the range of emotion from humor to pathos during a difficult time in American history. I made Lomax a Washington County, Arkansas, native since that was where my Lewis ancestors came from, and I could use some of my genealogy research for background. Because of all the bushwhackers and irregulars in northwest Arkansas during the war years, a family with Confederate leanings often shared homes with a family of Union sympathizers for their own mutual protection. This forced cohabitation forms the basis for much of the conflict in Redemption as the Lomax Family takes in the neighboring Burke family, whose mother, three daughters and son support the Northern cause. So, Redemption is not a typical western, and my new publisher came up with an unconventional cover for a western. At first, I was skeptical, but the publisher said the cover might be different enough to draw in readers who typically didn’t buy westerns. Eventually, the cover grew on me, but we’ll see how it goes over when it comes out later this year. I am curious, however, about any reactions others might have, so please share.